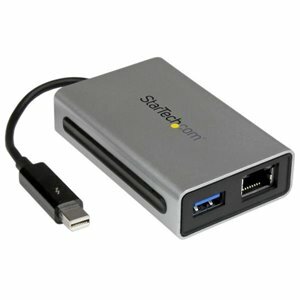 Add a Gigabit Ethernet port and a USB 3.0 hub port to your Thunderbolt -equipped MacBook or Ultrabook . The TB2USB3GE Thunderbolt to Gigabit Ethernet + USB 3.0 Adapter lets you expand your MacBook or laptop connectivity through a single, compact adapter with both Gigabit Ethernet and USB 3.0, delivering reliable performance, connection possibilities and rugged portability.Experience fast, effective and reliable performance from your essential peripherals! Leveraging the 10Gbps bandwidth of your Thunderbolt port for this dual-purpose adapter gives you reliable 1Gbps Ethernet and 5Gbps USB 3.0 connectivity, while enabling you to use both to their full capacity.To maximize efficiency, the Thunderbolt adapter separates traffic from each interface into its own dedicated 5Gbps PCI Express lane, effectively avoiding bottlenecks when both ports are in use. This practical adapter gives you fast, robust external connectivity, offered by revolutionary Thunderbolt technology.Take full advantage of your current peripherals! Saving you the added expense of purchasing new devices, the adapter lets you simultaneously connect your existing devices through your Thunderbolt port. Combining Thunderbolt to Ethernet and Thunderbolt to USB 3.0 functionality into a single adapter gives you two essential interfaces that are unavailable or limited on most Thunderbolt-equipped systems, making it easy for business users and home users alike to stay connected.Whether you're in a boardroom with a weak WiFi signal, or in a hotel with only a wired network connection, this adapter has you covered. Plus, the USB 3.0 port (with UASP support) can be used to connect a storage device, USB hub, USB printer, or sync with your tablet or smartphone.Get work done on the go, and look great doing it! A rugged and travel-friendly design lets you tuck the adapter neatly into your laptop bag, plus the lightweight casing merges portability with durability to offer quality protection that lets you take the adapter anywhere.The sleek and stylish adapter aesthetically matches your MacBook Pro or MacBook Air, with a silver sandblast finish and black rubberized grips. Plus, the compact adapter requires no external power, and integrates a built-in Thunderbolt cable as well as hassle-free plug-and-play installation. Whether you’re in a boardroom with a weak WiFi signal, or in a hotel with only a wired network connection, this adapter has you covered. Plus, the USB 3.0 port (with UASP support) can be used to connect a storage device, USB hub, USB printer, or sync with your tablet or smartphone. The sleek and stylish adapter aesthetically matches your MacBook Pro® or MacBook Air®, with a silver sandblast finish and black rubberized grips. Plus, the compact adapter requires no external power, and integrates a built-in Thunderbolt cable as well as hassle-free plug-and-play installation.